I have two out of three panels for the wall hanging finished. That sounds like a lot but these two panels are just the “quiet companions” for the center black panel which will be heavy with supplementary-weft patterning. So, while it might sound like 66% of the work is done, it isn’t so. Still, it feels good to have this project well under way. I have even wound the warp for the center panel and now need to install 312 heddles and wind 624 ends around the coil rod….it’s worth it! The black panel will have a lot of supplementary-weft inlay filling both positive and negative space. 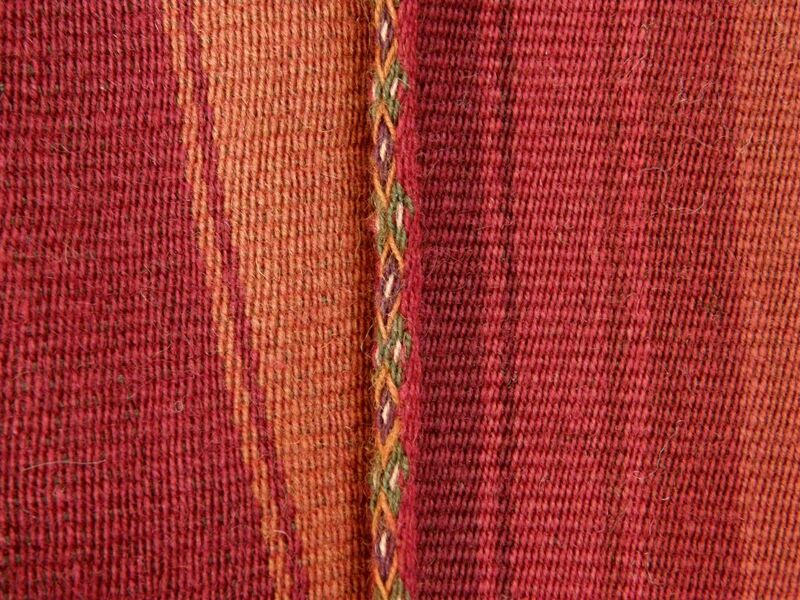 Then I would like to join the three panels across the top using weft twining and need to plan a design for that which will suit the woven patterns. 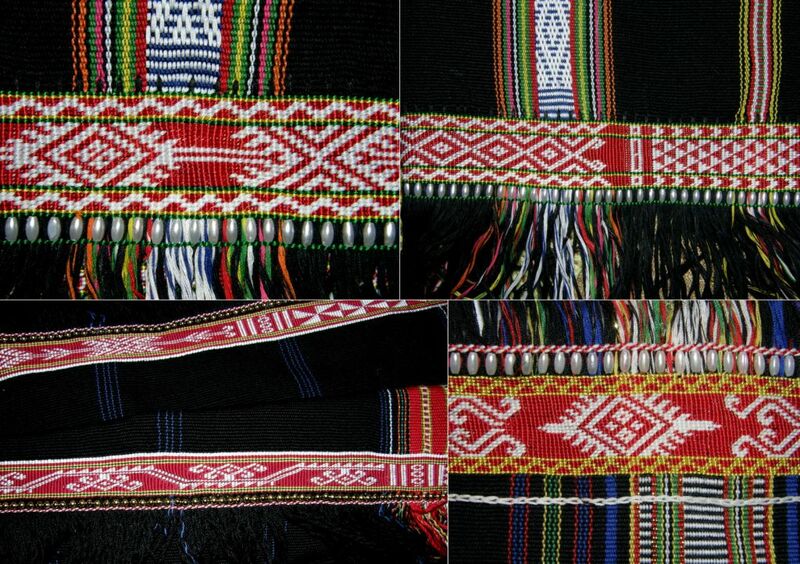 The Montagnard (Vietnamese hilltribe) backstrap weavers with whom I studied in the US use weft twining across the ends of the panels they sew together to make blankets. 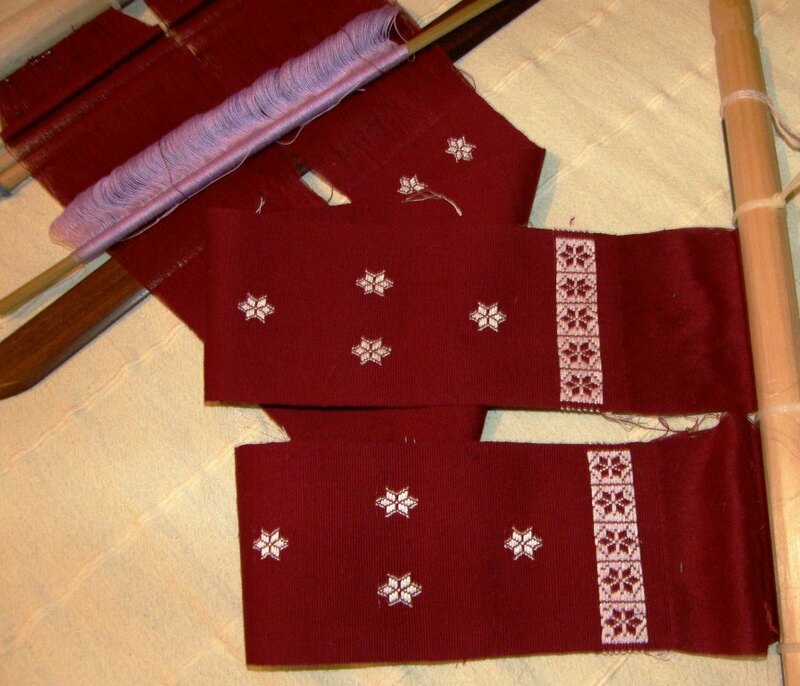 Two or three panels are sewn together once off the loom and then weft-twined patterns are added to one edge. Above you can see my teacher Nagch working on a piece draped over a frame. The colored threads that she uses to encircle the hanging warp-ends are held on small cement bobbins that she made. You can see how it is necessary to have the warps-ends under tension while the twining takes place. Nagch pulls the ends tight with one hand while twisting the bobbins with the other. LEFT: Twining class with Nagch at Betsy’s house. At right, Ju shows me how she gathers the warps in groups and sizes them before twining. 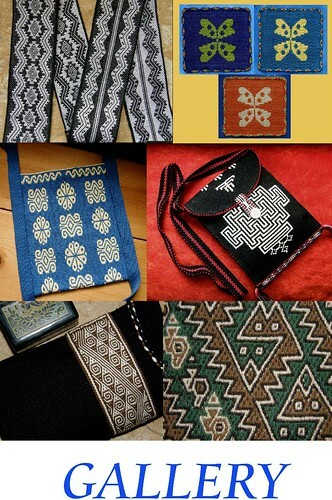 Here are some the beautiful examples of twining on the edges of Montagnard skirts and blankets made by Nagch and Ju Nie…just the right colors for my project! Twining on the bottom of a loin cloth. This image was shared with me by Susan Stem. I have tried weft twining both on and off the loom and it is far easier for me to control while the pieces are still on the loom with the warp ends under tension. As my wall hanging is nowhere near as wide as the Montagnard blankets and skirts, I will be able to put the three panels on my backstrap loom side by side and twine all the way across them. That will be the only place that the three panels will be connected. Then I will add some twining to the bottom of each individual panel. Again, it will be fun coming up with a design that works well with those on the panels. I think they will need the weight of the twining at the bottom to help them hang well. 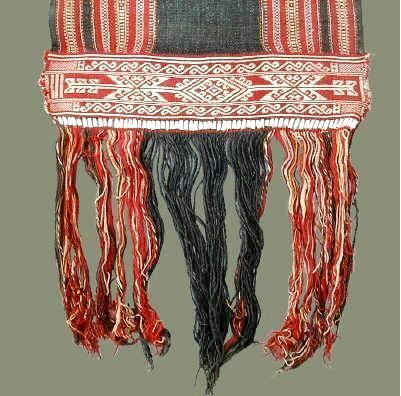 I have always imagined that one of the possible reasons Montagnard weavers add twining and beads to the bottom of the loin cloths they weave is for the added weight. You wouldn’t want the flaps of those loin cloths blowing about in the breeze! Anyway, that is what I envision for my wall hanging for the time being. Who knows how this plan will be modified along the way. I have other ideas for perhaps edging the piece with a tubular band. So, I took some time off from the wall hanging project and brushed up on a tubular band structure that Marijke van Epen and I studied together when I visited her in the Netherlands last year. We had a picture from a book and were able after a couple of attempts to figure it out. 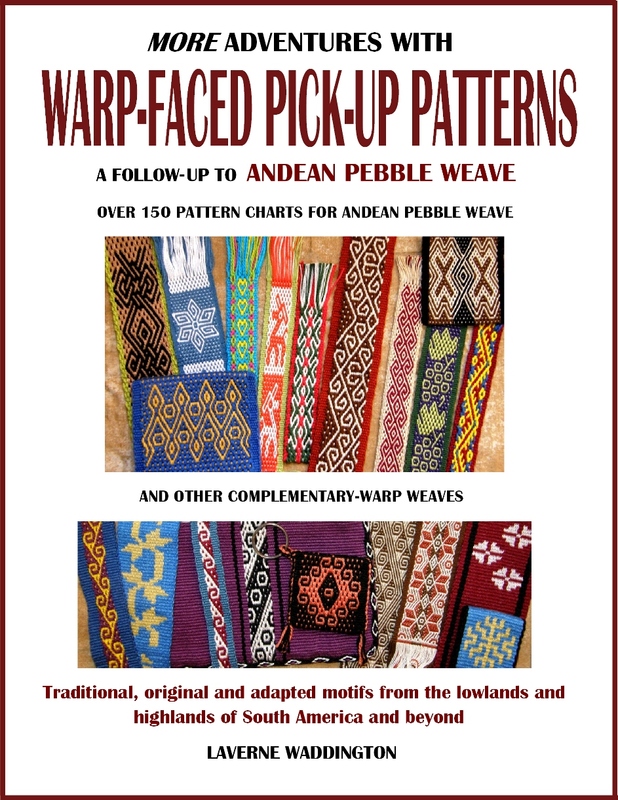 As luck would have it, just ten days after I got home from that trip, I went to Peru and came across a weaver from Chahuaytire, in the Cusco region, weaving and sewing one of these very bands to the edges of a large piece of woven cloth. I saw how he had set up the warp and separated the threads into their various heddles and was able to buy a prepared warp from him. It was a long loooong warp! 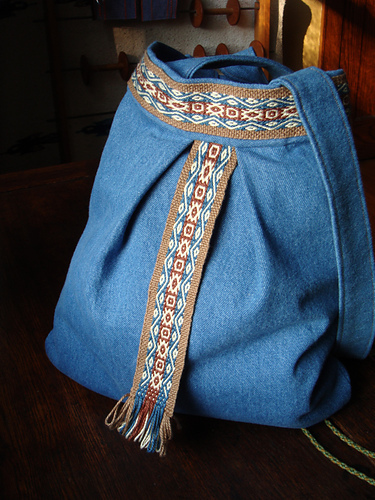 It was designed to go all the way around one of the typical large carrying cloths. Look at all that luscious handspun thread! 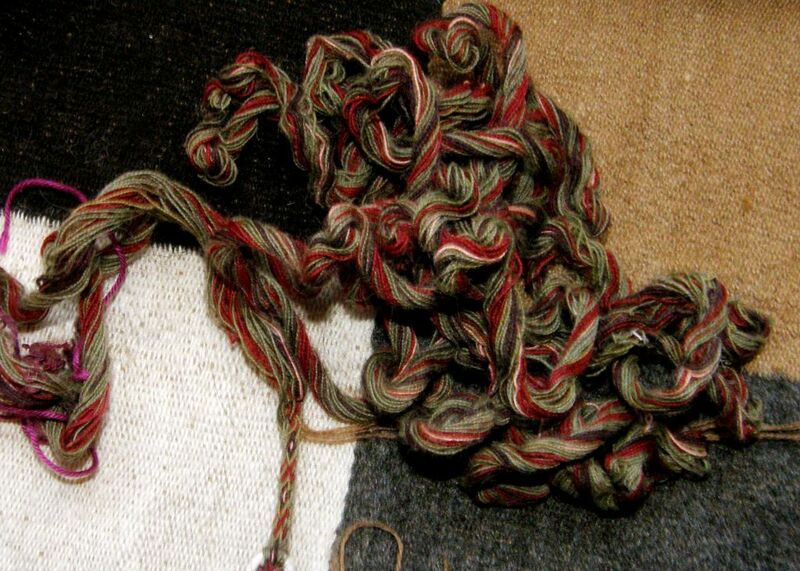 The thread was colored with natural dyes and some of the shades of green were very similar. This means that the pattern is a little hard to discern. 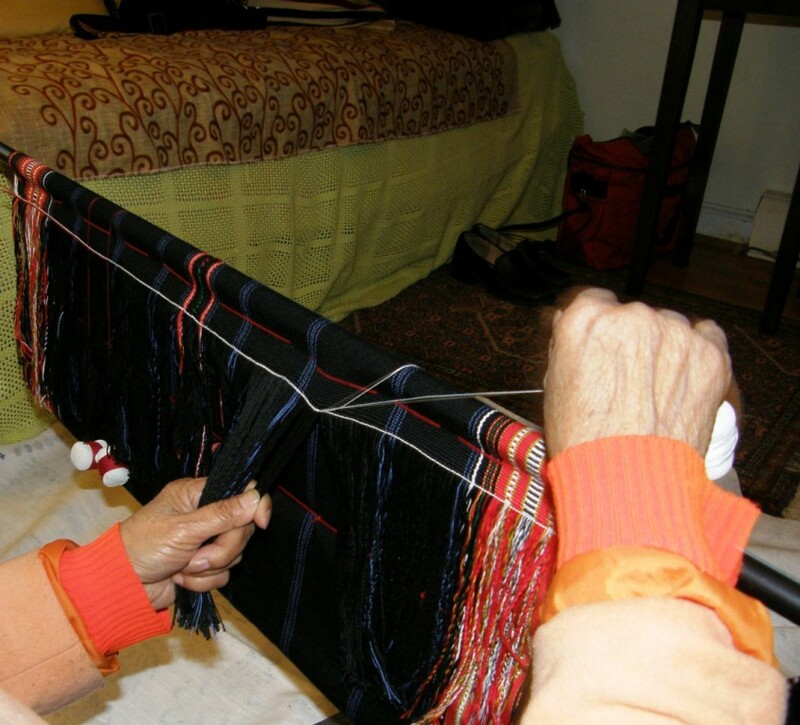 The example that Marijke and I had been studying in Nilda Callañaupa’s first book had been done in very bright and distinct colors…six in all counting the border color. I have made a few examples and have decided that I prefer a quieter version. The minimum number of colors could be as few as two. That’s just as well as my wall hanging uses only three colors. I have been sewing them along the edge of a wool band for practice. The one on the right is probably closest color-wise to the one in Nilda’s book. There is one fewer color in my wool version in the center. Here is one from Chahuaytire that I photographed at the CTTC stall at the Santa Fe International Folk Art Market in July….those colors are so gorgeous! Weft twined bottoms and tops and tubular edgings…it seems that I am more intent on thinking about the finishing touches for this project before I can even get started on the meaty part of it. And, while on the same break…basically dithering around before getting into what I was really supposed to be doing, that is, winding the warp for the black panel….I decided to continue the three-color Andean Pebble weave sampler. It was coming out so well that I decided that I really needed to use it for something. I will probably sew it onto a woven piece of fabric. Too bad we won’t be able to appreciate the fact that it is reversible that way but it just so happens that all the mistakes are on the back! Never mind, there are some bigger and better projects yet to come using this structure! The flower head motif is the center and I am now working my way backwards repeating the patterns. There you can see the hummingbird sipping from its flower. 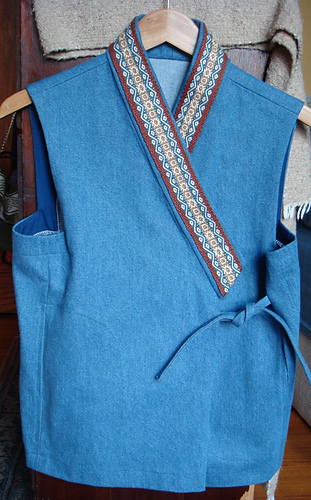 Now, if only I were as talented with fabric and sewing needle as Julia…. 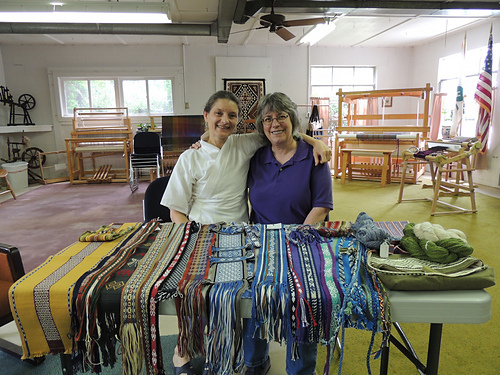 Julia and Cindy, who are both in the Ravelry group and live on opposite sides of the US, got together at the Mannings to show and share their backstrap weaving work. Cindy lives in the northwest and has woven with me and Julia and I have gotten together a couple of times too. That’s Julia on the left and Cindy on the right. That’s an impressive display of their collective backstrap weaving work! 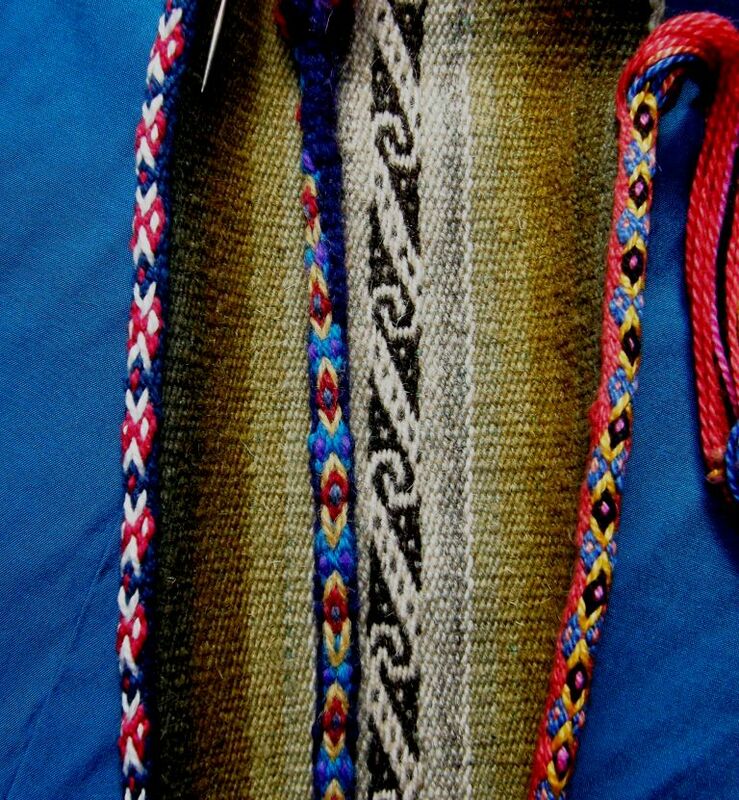 I see some weft inlay work in there amongst the pebble weave and there must be a bunch of tubular bands there too. 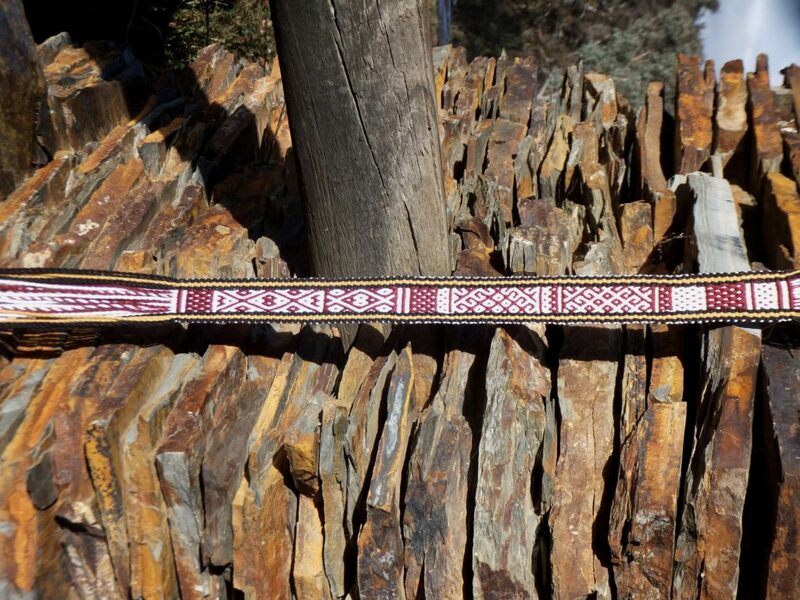 Father Kyriakos in Australia sent me a picture of his Andean pebble weave work. He has both my books and is playing with color changes as well as working on using narrow patterns with reversals and reflections to create wider designs. I would say that he is a natural! Well, that’s enough thinking ahead about how my wall hanging will be finished. It’s time to knuckle down and continue weaving it. I am off to dress up that black warp with its heddles and coil rod….see you next week. Yes, I also am interested to see how you design the central panel and finish the hanging with weft twining. Thanks for the weaving encouragement. 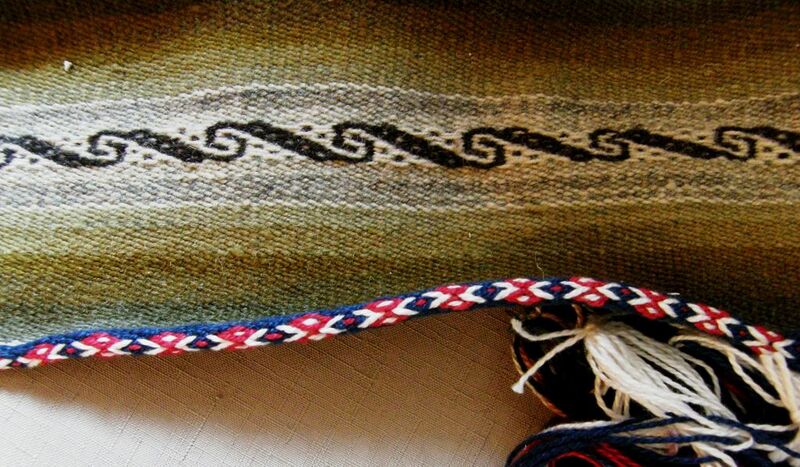 What a great idea to connect all three of your panels with weft twining all across! The side panels are beautiful! The completed hanging will no doubt be gorgeous. OOoooo more beautiful tubular bands to learn at some point. Do you know how your teacher Nagch made her cement bobbins? I’d like to try making some. You are correct, Father Kyriakos is a natural – very beautiful work. 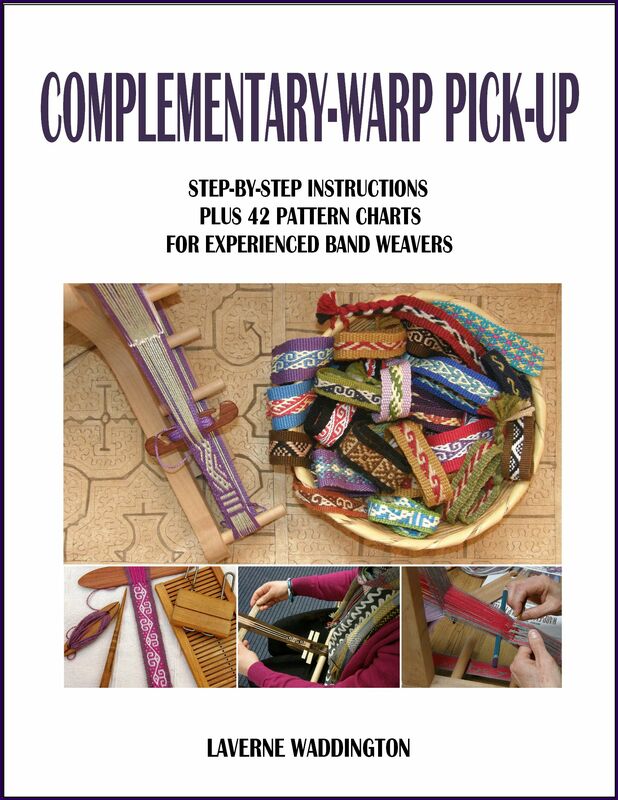 Now that we have Laverne’s books in our weaving library, (thank you, Laverne) backstrap and pebble weaving are a lot more enjoyable and understandable with the clear instructions and photos. The spotted chart method of designing has also made copying designs faster and easier — for use in new projects in the near future, I hope. Thank you for your comment, also, Julia. In fact it was your multicolour band that Laverne posted that I copied the design from last night and hope to use soon. Father Kyriakos, that is great!! I look forward to seeing your version of the pattern. 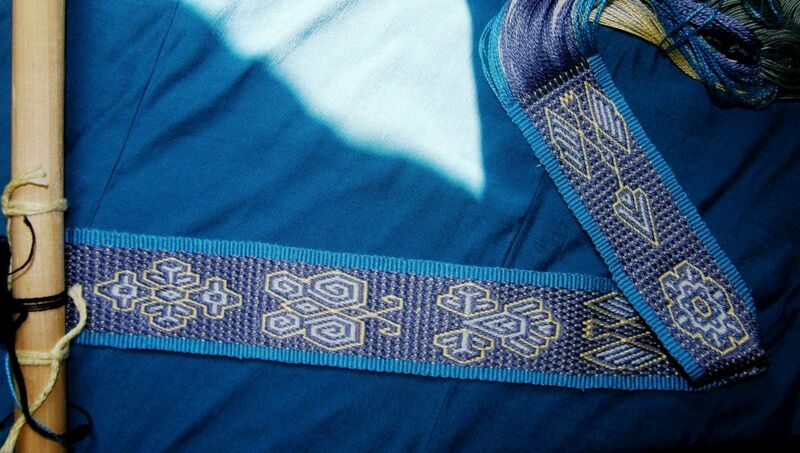 I took the pattern from a Sashiko design, which is traditional Japanese stitching. 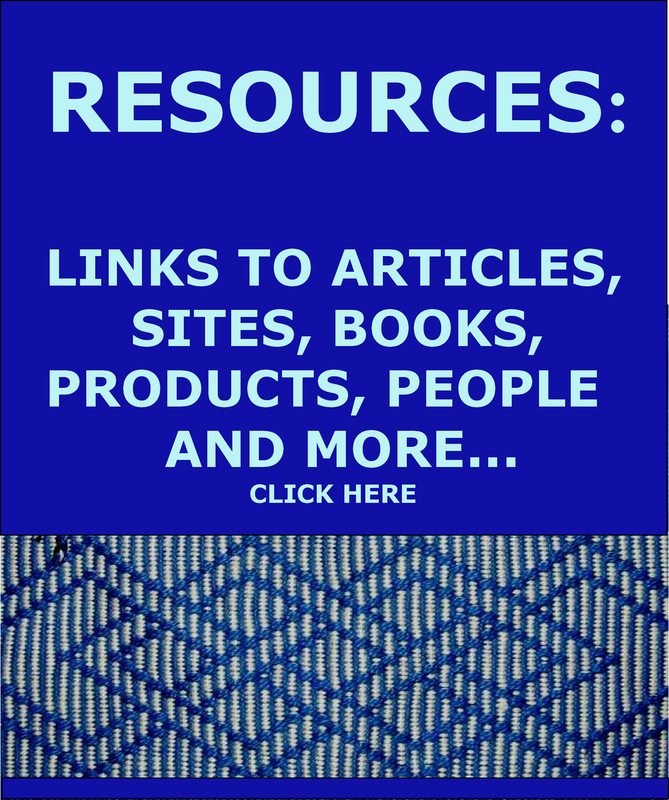 I agree with you about Laverne’s books – so clear and helpful. 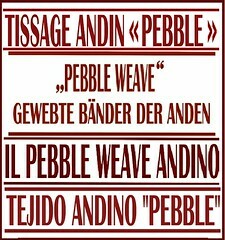 I also love the spot chart – this pebble weaving is just so much fun, isn’t it?